The 25th International Symposium on Lepton Photon Interactions at High Energies (Lepton-Photon 2011) will be held at the Homi Bhabha Auditorium of Tata Institute of Fundamental Research during 22-27 August, 2011. This symposium is one of two major international conferences in the field of High Energy Physics sponsored by the International Union of Pure and Applied Physics (IUPAP). It is being held for the first time in India. The conference covers theoretical and experimental aspects of elementary particle physics. Here the latest results are announced from accelerator experiments searching for new elementary particles, as well as from deep underground and space-based detectors studying neutrinos, dark matter and cosmic rays. The field of High Energy Physics (HEP) explores the nature of matter and forces at the fundamental level. We now know that matter is made up of two classes of elementary particles: "quarks" (which combine to make protons and neutrons) and "leptons" (which include electrons and neutrinos). The interaction forces between these particles arise from the exchange of another class of elementary particles, the force carriers (which includes the photon, the carrier of the electromagnetic force). The spectacular progress in HEP during the last century has led to the emergence of the "Standard Model" of particle physics, which has explained, to a high degree of precision, almost all the observations made at numerous HEP experiments around the world. Among the people who participated in this development, more than 40 physicists were awarded the Nobel Prize for their work. What remains to be learned? Despite the enormous successes outlined above, some features of the Standard Model remain incompletely understood and there are also theoretical proposals for new particles and forces beyond this model. These issues can only be settled by new experiments, currently being carried out at particle accelerators like the Large Hadron Collider (LHC) at CERN in Switzerland, which is the flagship international project in HEP. It is expected that the last essential (and so far elusive) ingredient of the Standard Model, the Higgs particle, will be found at the LHC. Researchers at accelerators are also looking for signals of new phenomena that go beyond the Standard Model and for which at present we have only theoretical hints. These include a proposed new symmetry of nature called "supersymmetry" which is associated to possible new "superparticles", as well as additional dimensions of space that have so far remained hidden from us. Experimental research in elementary particles is also pursued outside the domain of accelerators, by studying particles of astronomical origin. In this domain of "astro-particle physics", phenomena like neutrino masses, cosmic rays, dark matter, and dark energy are being explored. Research in particle physics has enabled us to begin answering fundamental questions about what we are made up of and how we got to be here. It has also led to spin-offs like the World Wide Web, grid computing, medical imaging applications and new acceleration, cooling and detection technologies. An event at CMS where two Z bosons decay into electrons and muons (red lines). 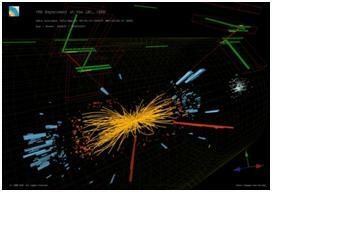 Such events are being analysed to search for the Higgs boson. India has a long and rich tradition of research in high energy physics. The first ever detection of atmospheric neutrinos took place at the deep underground laboratory at Kolar Gold Fields near Bangalore. Today India has a large number of researchers working in all areas of high energy physics. India has participated actively in international accelerator-based experiments including those at CERN, Fermilab, KEK and Brookhaven. There also exist several major experiments designed and constructed in India in the fields of astro-particle physics and cosmic ray physics. A large underground laboratory for conducting neutrino physics experiments, the India-based Neutrino Observatory (INO) is being set up near Madurai. The Indian theoretical high energy physics community also has a strong international presence and recognition. The country has a vibrant community of highly motivated students carrying out Ph.D. level research in both theory and experiment at universities, IIT’s and research institutes. India has contributed significantly to the design and construction of the CMS and ALICE detectors at the LHC and even to the construction of the Collider itself. In particular, the Outer Hadron Calorimeter of CMS and the Photon Multiplicity Detector of ALICE were entirely fabricated in India. A silicon strip detector using advanced technology was manufactured (for CMS) by Indian industry for the first time, and a large cathode strip chamber for the ALICE muon arm was built here. Today, over 100 Indian scientists are part of the CMS and ALICE experiments. A similar number of Indian theoreticians have been involved in formulating theories and shaping predictions for these experiments. Two of the particle detectors at the Large Hadron Collider (LHC), named ATLAS and CMS, are designed to search for the Higgs boson and for new particles beyond the standard model such as supersymmetric particles. The LHC has been operating since the last two years and its rate of data collection in recent times has exceeded expectations. Based on this, the CMS and ATLAS experiments are in a very good position to explore the existence of a Higgs in a mass range from 150 to 600 Giga electron-Volts (GeV). They are also well-placed to detect any particles beyond the Standard Model with masses upto around 1000 GeV (for comparison, the mass of a proton is about 1 GeV). The latest results will be announced for the first time at Lepton Photon 2011 by representatives of these collaborations. Besides its role in studying elementary particles, the LHC is also the most powerful accelerator for studying the physics of heavy ions. A dedicated detector, ALICE, observes these collisions. Ions are atoms that have been stripped of their electrons leaving only the nuclei behind. At extremely high pressures and temperatures, heavy ions are expected to melt into a state known as "quark-gluon plasma" whose nature will provide key insights into the behaviour of matter under conditions similar to those at the birth of the universe. The Relativistic Heavy Ion Collider (RHIC) in the USA has been performing research in this area since the last decade and its results will be presented as well. The other major particle accelerator in the world, the Tevatron at Fermilab in the USA, is closing down in a month. It has already collected a large amount of data that is still being analysed. Therefore Lepton-Photon 2011 represents a unique opportunity to compare results from the Tevatron with those from the LHC. Neutrinos fall into the lepton family but have properties that are unique among elementary particles. They are uncharged and interact very weakly with matter, and remarkably the three types of neutrinos "oscillate" into each other as they travel. Neutrino oscillations have been observed by measuring deficiencies in the neutrino flux from the sun and the earth’s atmosphere. Recent experiments at the T2K experiment in Japan, the OPERA experiment in Europe and the MINOS experiment in the USA, have also detected the appearance of neutrinos through oscillations in terrestrial neutrino beams. Their latest results will be announced at Lepton-Photon 2011. The Planck space observatory has collected unprecedented amounts of data about the "cosmic microwave background radiation" that pervades the universe and is a relic from the very beginning of time. Irregularities, or "anisotropies", in this radiation carry important information about the early universe and the subsequent formation of stars and galaxies. The participants of Lepton-Photon 2011 can expect to hear the latest developments from this fascinating space probe. Who will be at Lepton Photon 2011 ? The Directors of all the major particle physics laboratories: CERN (Switzerland), Fermilab (USA), KEK (Japan) as well as the Institute of High Energy Physics (China) will participate in the conference. The speakers will include representatives of specific experimental collaborations at these and other laboratories worldwide, and leading scientists from India. There will also be talks on the INO and other future projects. Important committee meetings will be held on the sidelines of the main conference: the IUPAP Commission on HEP, the International Committee on Future Accelerators (ICFA) and the International Linear Collider Steering Committee (ILCSC) among others. A satellite meeting on Quantum Chromodynamics, the part of the Standard Model that describes strong nuclear interactions, will also take place at the Indian Institute of Technology (IIT) Mumbai. Lepton-Photon 2011 will provide a unique opportunity for young Indian physicists working in this field and especially for students to gain exposure and interact with the world high energy physics community that will be participating in this meeting.